On the afternoon of the second day of OCEANDOTCOMM, I joined a tour of the salt marshes to explore restoration efforts, led by Dr. Denise Reed. 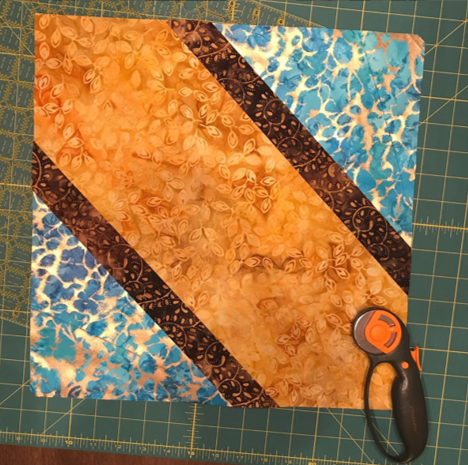 I blogged about that fieldtrip (visit to view images and to hear Dr. Reed speak), and here is the part of the trip that served as the inspiration for my newest addition to the Stitching Hope for the Coast project, where I am quilting stories of coastal optimism. My favorite spot and stop of the day was our first location – originally, this was completely under water. But now, this area is becoming stabilized by dredged material and plant growth. This ground sunk slightly under our feet as we walked around. You can still see the tire tracks of the tractors as this material was pushed around. Around the edge is a rim of material higher in elevation. In the video clip below, Dr. Reed discusses the trade-offs of quickly establishing a marsh vs. having an area where fish can inhabit. To tell this story, I decided to space out the batik-patterned fabric across a set of four panels. I created the quilt pattern on my own, keeping the cutting and display simple while letting the fabrics indicate the physical environments. 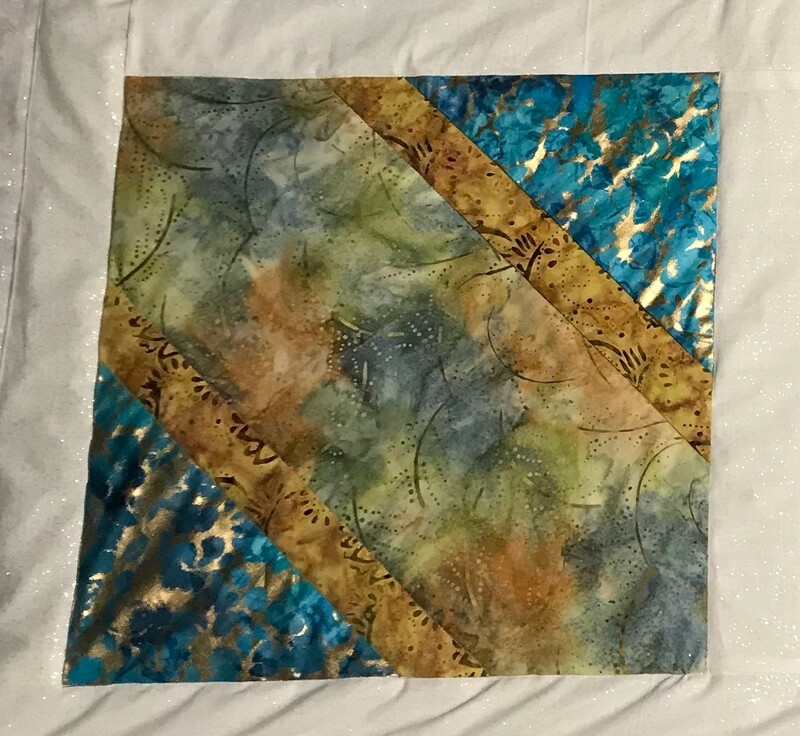 I chose a glittery white and grey fabric for around the borders to compliment the batiks I used for each square, while not competing with those blue, green, yellow, and brown colors. 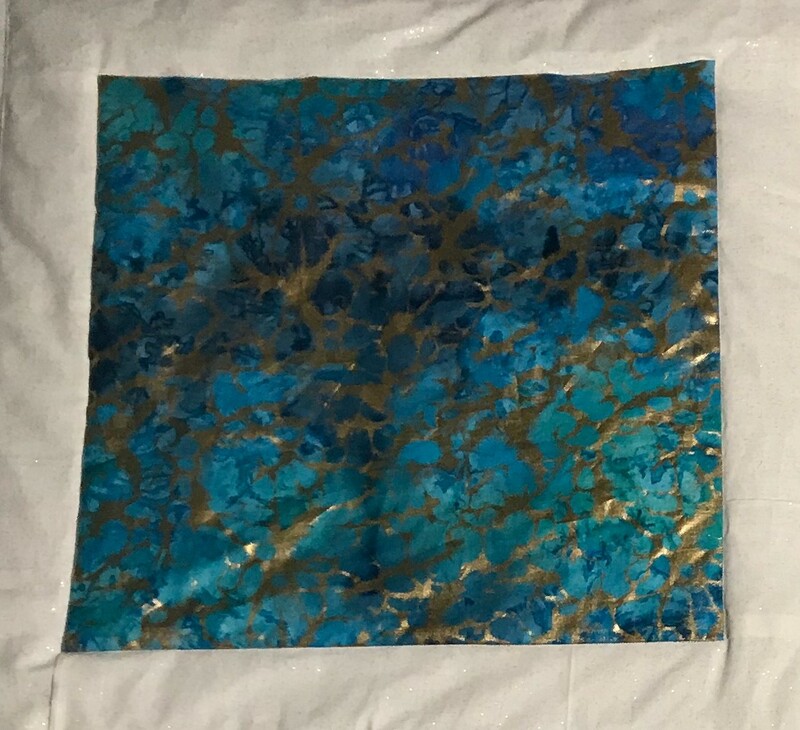 For my first block, I selected this blue fabric with gold highlights to represent shallow water. On our fieldtrip, we traveled by boat to a location that was entirely open water, but now, sediments have been brought in to the area so that a salt marsh could be quickly established. The sediment volume is brought in as a slurry using a dredge. Enough sand is utilized to bring the sandy surface high enough so it is only flooded by very high tides. There is a containment berm around the outer edge of this new land to keep the new sediments in place. 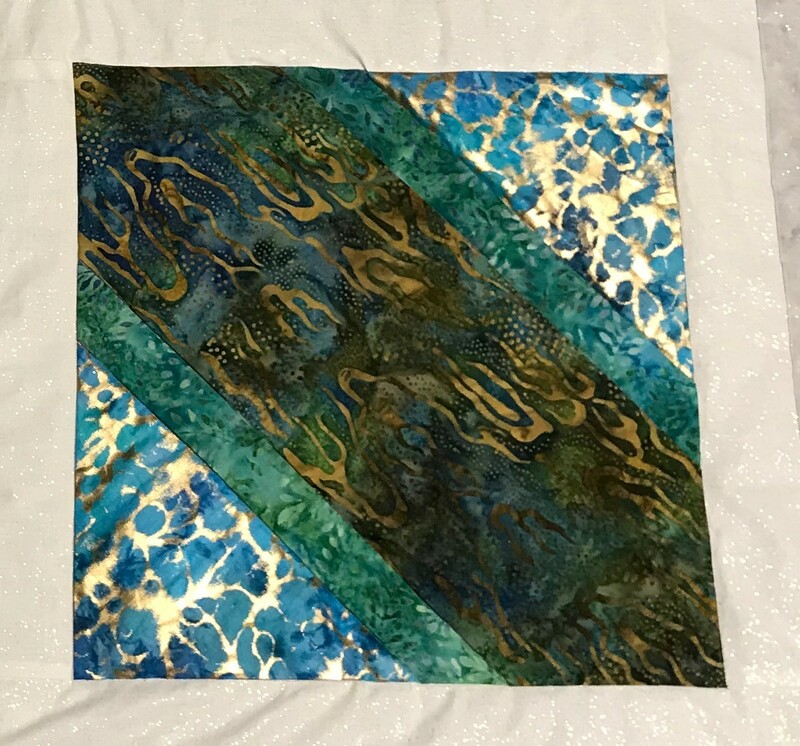 I used the same blue/gold batik fabric to represent the shallow water. The yellow fabric is for the sand slurry that is brought in and is exposed above the water level, while the dark brown represents the berm of higher elevation to contain the sand that was brought in. With time, plants are able to establish and grow. Again, the blue/gold fabric represents shallow water. The sandy area now has a green coloration to represent the appearance of vegetation, and the blue for water when there is flooding. The berm is shown as a lighter brown/gold color, representing the settling and compaction of the sediments which lowers the berm elevation (but still enough to serve as a berm). It continues to take time for the sand to compact, and this area will eventually become flooded more regularly by the tides like the surrounding marshes. This shallow water wetland is not ideal for a fisheries habitat yet as it is too high (too shallow), but will serve to help stabilize the shore. These fabrics were selected to show more vegetation and water, as the sand is now partially submerged. 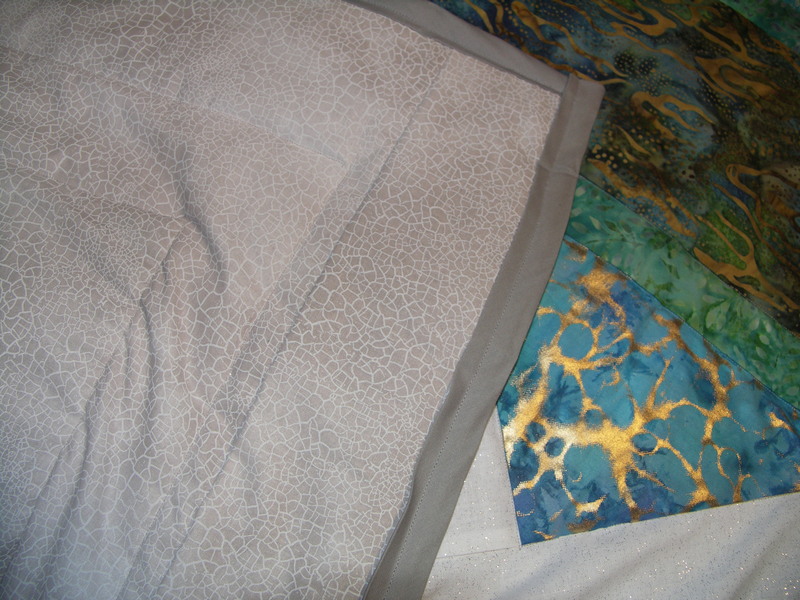 For the back of the quilt, I selected this fabric that looks like mudcracks. The field location we stopped at was filled with mudcracks across the surface, and I spent much time exploring and photographing them. Check out my blog post that summarizes our day in the field and my personal story about mudcracks. This is my story of coastal optimism – a story of how humans can dredge sediment from one location in a bayou to another to provide stability in the coastal zone. 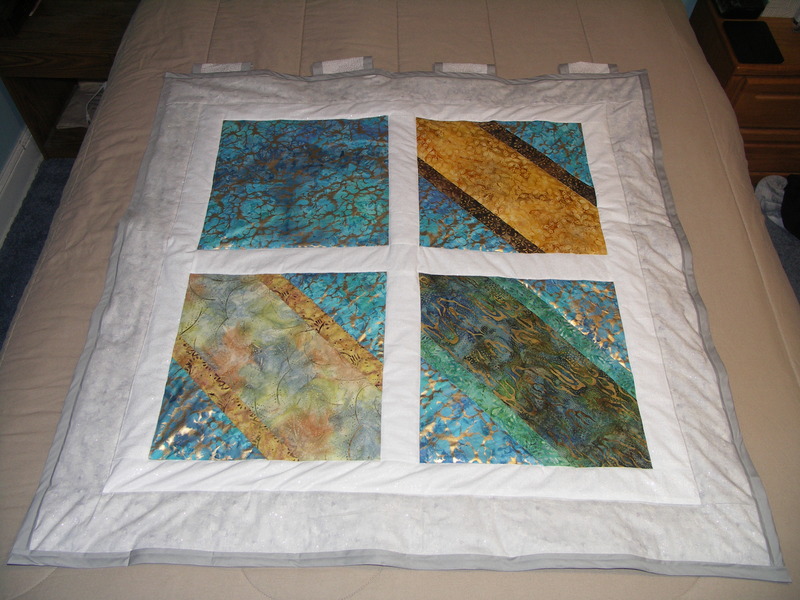 The quilt measures 45 inches wide by 45 inches in height with fabric from JOANN Fabric & Craft (Springfield). So thank you to Dr. Denise Reed and her fieldtrip at OCEANDOTCOMM, which led me to ask questions, which led me to this story!